This off-white piece of paper is 5 1/2" x 5 11/16". It has some marks on it but is otherwise clean and in good condition. I found no watermark. It was previously folded in half down the middle horizontally, but I flattened it. I'm getting the impression that Jean La Forêt liked to have things organized. This is the fourth item I've found in my little treasure chest where he has typed up information to create what appears to be a sort of reference sheet. Earlier we've seen the introduction to his will and life story, the list of ailments from which he was suffering, and a timeline of his U.S. military service. Before that he had created lists in his journal. Although there is no date on this sheet, I can estimate when it was typed because Jean included his birthdate, December 4, 1851, and wrote that he was almost 73. As he would have turned 73 on December 4, 1924, this was probably typed late in 1924 but before his birthday. Jean and Emma were still living in Missouri at this time, and we even have the full address. They had moved again: In 1920 they were in Overland, in 1921 in Maryland Heights, and in 1924 in Creve-Coeur. The move to Maryland Heights was about 5 miles to the west; Creve-Coeur is about 4 miles south of Maryland Heights. They were not moving far, but they did keep moving. ". . . we lost a great deal during the war, on account of the war, and were really in need, living for the present on my husband's retired pay, almost not sufficient to live on, and nothing else in view . 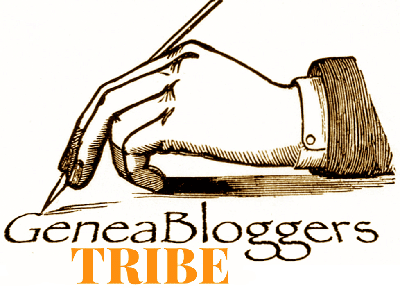 . ."
So maybe they were constantly moving because of their straitened circumstances. 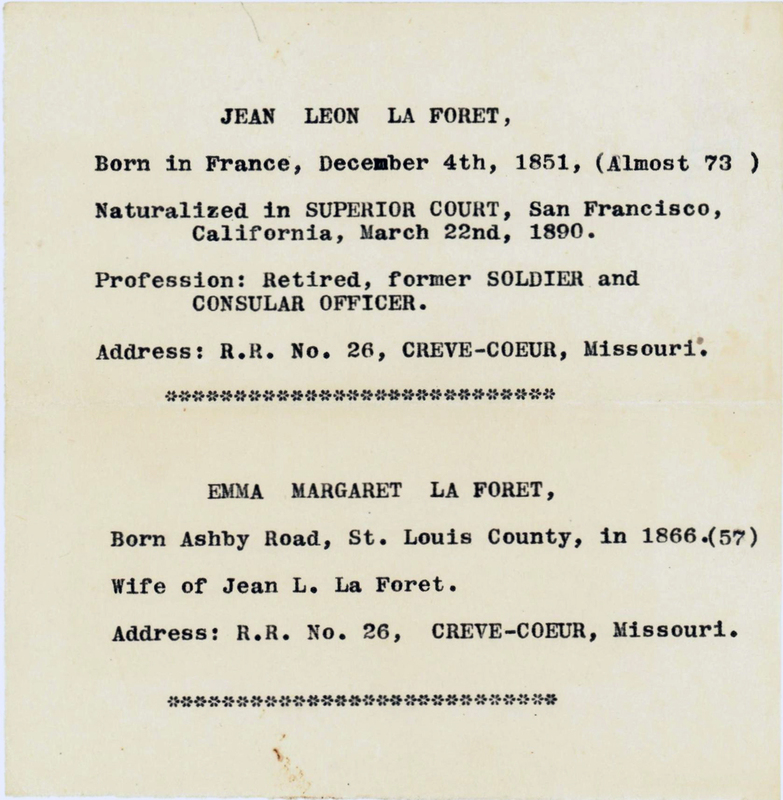 I found it interesting that Jean included his naturalization date in this little synopsis of his life, especially since he did not write that he was born in France. What made it important to note that he was an American citizen? Emma gets somewhat short shrift in this little note. Jean did not give her complete birthdate, and her occupation is simply that of being his wife. One last thing about the note is that it further pushes back the date that Jean and Emma could have returned to California. So Jean's list of ailments is starting to look as though it might have been typed even as late as 1925. 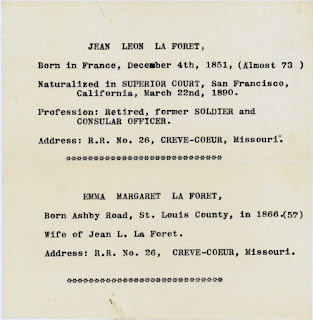 The final item to mention here is that this post marks one year that I have been writing about my "treasure chest" of documents relating to Emma Margaret Schafer and Jean Leon La Forêt. My post about the first of Emma's documents was on December 17, 2015. It seems so long ago! And I know I have at least another year's worth of documents to go!